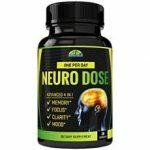 EzyAbsorb Neuro Dose Reviews: Does It Work? What is the EzyAbsorb Neuro Dose? The EzyAbsorb Neuro Dose Pill is a nootropic supplement that claims to help provide support for the core functions of the brain. The manufacturer claims that it can help improve the level of effectiveness that the rain has when it comes to functions like focus and memory capacity, while also ensuring that the body is able to receive various additional benefits. Who is the Manufacturer of the EzyAbsorb Neuro Dose? The EzyAbsorb Neuro Dose was manufactured by ezyAbsorb. ezyAbsorb operates as a healthcare company and they provide a wide array of products that help people improve the quality of their lives. They specialize in making supplements and products that affects a wide array of human life, from support for blood sugar and brain function enhancement to stamina and endurance support they believe that it doesn’t take much for people to live healthy lives, and they are doing their part in helping people stay in a general good health. As it is usually seen with various brain supplements, this one is taken in through the mouth and upon digestion, the product releases its ingredients to affect mental pointers in the body. The product helps to boost the level of blood circulation in the body. This blood carries oxygen to various organs, thereby aiding their performance and ensuring that they are able to work more effectively. The brain is one of the organs that benefit from this release of blood, and an enhancement of the brain’s functionality means that it will be able to help the user focus more, learn more, and remember at a faster and more effective rate. EzyAbsorb Neuro Dose Ingredients- Are they Safe & Effective? The EzyAbsorb Neuro Dose contains a wide array of ingredients all of which have been touted by the manufacturer as effective and safe for consumption. The manufacturers claim that they have employed exert manufacturing techniques in combining these ingredients, and they have assured users of an absence of side effects. DMAE L- Bitartrate – DMAE Can help improve mood, memory and thinking skills. Huperzine A – Huperzine A can help combat Alzheimer’s disease, and it can also help with age-related learning impairment. Ginkgo Biloba – Promotes circulation in the brain, thereby helping improve cognitive function. Silicon Dioxide – Used as an additive, and helps to preserve the effectiveness of the product. What are the Advantages of EzyAbsorb Neuro Dose? The manufacturers of the product also claim that it can help improve levels of memory retention. The product also has benefits that can benefit overall body health. It also claims to be able to help boost the circulation of blood in the brain, which will in turn help improve metabolic activity in the body. According to its list of ingredients, the product is also able to help enhance the learning capability and mental alertness. What are the Disadvantages of EzyAbsorb Neuro Dose? Some of the products need further clarification to ascertain their effectiveness. How Should You take EzyAbsorb Neuro Dose? A bottle of the EzyAbsorb Neuro Dose contains 60 capsules, and the manufacturers recommend that you take a single capsule of the product every day. How Much Does EzyAbsorb Neuro Dose cost? As of this writing, the EzyAbsorb Neuro Dose is available on various retailer platforms. However, it goes for $14.95. What is EzyAbsorb Neuro Dose Return Policy? There isn’t any information on the manufacturer’s website about their return policy, so it might not be possible to ascertain what it is. Does the EzyAbsorb Neuro Dose Offer a Free Trial? It doesn’t seem like the manufacturers do, especially as their website doesn’t contain related information. As a conclusion, the EzyAbsorb Neuro Dose might be the solution that you need for improved mental capacity and functionality, as it claims to be able to boost focus, memory retention, and much more. However, the possibility of side effects and its incompatibility with other medications might hurt its claim. You might end up not wanting to get this product, and that’s completely fine. If that’s the case, just make sure to look through a list of viable alternatives such as brain enhancing pills.